MISSION, KS--(Marketwired - Jan 8, 2015) - (Family Features) While the winter may make for a tempting time to curl up on the couch, adapting your routine is essential for year-round well-being, whether you're a professional athlete or an average person looking to stay on top of your game. 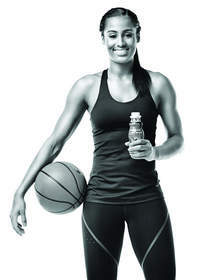 "As an athlete I am just like everyone else -- when it's dark and cold outside it can be harder for me to stay motivated to keep up with my workouts," said women's professional basketball star Skylar Diggins. "But hibernating in the off season isn't an option for me, nor should it be for anyone who wants to stay in shape year-round." Power up with protein. It's important to give your body the proper protein to fuel your workout -- both before and after exercise. Protein drinks are one way to reward your muscles and power your body for intense exercise. Made with real milk, Rockin' Refuel Lean Builder, available in chocolate and vanilla varieties, is the protein drink Diggins prefers. It's a delicious low carb, low sugar option that has 20 grams of high quality protein and only 150 calories. Keep it close to home. Whether you're snowed in or stuck inside a hotel room, fight the urge to skip your workout by keeping it quick and simple. Great abs don't need a gym, just a little bit of floor space. One of Diggins' favorite ways to keep a toned stomach is alternating reps of sit-ups with bicycle crunches and side planks. You can also incorporate jumping rope and doing an "indoor run" by walking up and down the stairs. Don't make excuses. This time of year is busy for everyone. Maximize your time by doing little things when you can, like calf raises in the shower, choosing the stairs, or repeating lunges until you get to the other side of a room. Keep a light set of hand weights under the couch for a quick arm workout during your favorite TV show. For more tips to keep your routine fresh and fun while indoors this winter, check out Rockin' Refuel on Facebook at www.facebook.com/rockinrefuel.